Then click on the button "Multiple Pages". Press the button "Scan" and scan each page. When you have finished the scan of multiple pages click on the button "To PDF" (Image-2). See also: ► Preview, rotate, customize the page to PDF! ► Change the default location for scanned documents! (Image-1) Switch to multiple pages scan! This solution to scan multiple pages and create a single PDF works on: Windows 10, Windows 8.1 & 8, Windows 7, Vista, XP, Windows Server 2008-2016, etc. (Image-3) Save the multi-pages to a PDF file! Often we are in the situation of having to scan documents or printouts to be converted to PDF, and very often the two operations must be performed by using different software. This Software we'll take you to download and use a very simple but very effective software that makes scanning and converting to PDF very fast. 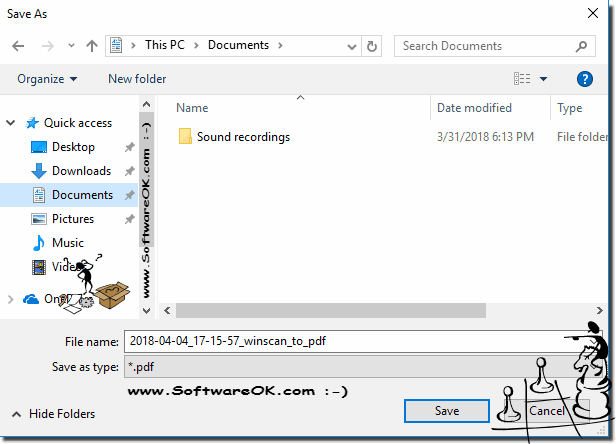 WinScan2PDF. The software is only available for Windows operating systems, it is completely free of charge, requires no installation and therefore becomes portable and usable from any USB stick. 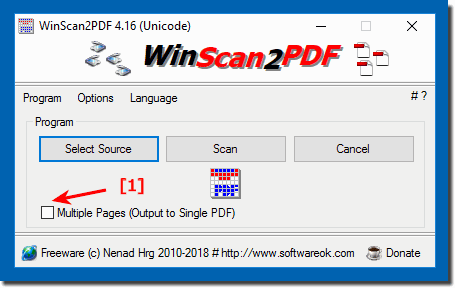 WinScan2PDF - FAQ-1: Scan multiple pages and create (save) as a single PDF file? Scan on windows 10 and save in pdf? The program works flawlessly when scanning single pages, both via flatbed support and automatic paper feed. When scanning multi-page documents from the paper feeder, 2 pages are still fed and scanned, but when linked to a pdf file, the program crashes. The two single pages are then available as BMP and JPG in the Temp folder. If there are more than two pages, the scanning process stops after the second page has been scanned. Program says goodbye. Sheet 2 is not completely ejected from the scanner and sheet 3 is no longer retracted.? I have made a mistake: I had selected the normal single scan mode and simply put several pages in the selected paper feeder. The program has swallowed from the second page then, as it has probably expected only one page in the paper feeder. If I have the option "multiple pages", all pages will first be scanned individually into the list and then combined with "create pdf".? Scanning multiple single pages to produce individual pdf? Multiple pages scan windows 10? 3 pages scanning in one document? Save several pdf pages to one page? Scan several pages and save them individually? Windows scan multiple pages scanning? Win 10 scan multiple pages? Multiple scans in one scan? Two-sided scans on one side? Multiple scanns in eggs file office 10? Save multiple PDF files as one? Do you want to scan a document? Multiple scans in a pdf? Scan2 pdf scan multiple pages? How do you get several scans into a pdf? Windows 10 multiple pages scan? Scan individual pages as a file from book? Samsung printer to send more pages than a pdf? Can one also scan several pages and save as pdf, with WinScan2Pdf? Is it possible to scan and save several pages on Windows 10? Create PDF plus order of pages, is that possible?